There is always a certain apprehension when visiting somewhere for the first time and being an Assistant Provincial Grand Master on his first visit to St Annes Palace. John Davies (left) is congratulated by his predecessor Ted Eaves. David Walmsley might have been forgiven for being a bit trepidatious. Not that he showed it and why should he, having lived around the corner in a little village called Preston for some years. Joking apart, David held warm memories of visits to local spots such as Fairhaven and the St Anne’s coastline. He was, therefore, very pleased to be visiting Melita Lodge No 6783 as principal guest at their installation meeting. David was not completely amongst strangers however, having been a Provincial Grand Steward during 1994, along with South Fylde Group Chairman Ian Ward and grand officer Mike Goodwin. Not to mention David Randerson with whom he used to work when they were Group Chairmen of the Eccles and South Fylde Groups respectively. However, that said, with the lodge business swiftly expedited it was time for David Walmsley, as the principal guest, to be welcomed into the lodge. David was accompanied by Past Junior Grand Deacon Stuart Thornber, the Provincial Grand Chaplain Godfrey Hirst and South Fylde Group Chairman Ian Ward, and grand officers David Randerson and Mike Goodwin. Provincial Grand Sword Bearer David Kenworthy with several other Provincial grand officers and other distinguished brethren were also in support. Pictured from left to right, are: David Walmsley, John Davies and Ted Eaves. The usual salutations were led by Roland Alderton the lodge director of ceremonies followed by the installing master inviting John Bainbridge to act as senior warden, Geoff Crosland as junior warden and Bob Taylor as inner guard. The master elect John Davies was then presented by Mike Goodwin and expertly installed into the chair of King Solomon by Mike Notman. The working tools in the third degree were presented by Tony Alderton, those in the second degree by Bob Avery and the first degree tools were explained by Roland Alderton in an excellent manner. Brian Pearson delivered the address to the master as only he can, Ian Ward delivered the address to the wardens in an excellent manner then the address to the brethren was expertly delivered by David Walmsley. At the conclusion of the ceremony David Walmsley delivered the congratulations of the Provincial Grand Master Tony Harrison to the new master. He also assured those present that had Tony been able to attend this excellent installation he would have been very impressed by Mike Notman’s splendid ceremony. David expressed his admiration for Brian Pearson for his memorable delivery of the address to the master. 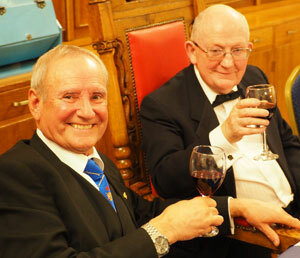 David Walmsley (left) taking wine with new master John Davies. Responding on behalf of the grand officers present in the lodge room, Ian Ward offered warmest congratulations to the new master on attaining the master’s chair of Melita Lodge for the first time. He said that it was a privilege to respond after such an excellent ceremony by Mike Notman. Simon Walker, responding on behalf of the Provincial grand officers, offered their congratulations and wished John the best of health to enjoy his year in the chair stating that he knew how much John had been looking forward to going into the chair. Responding to the toast to the grand officers at the festive board, David Walmsley thanked everyone in the lodge for the warmth of his welcome. He referred to his year as Provincial Grand Steward and was pleased to be in the company of his fellows in that rank, Mike Goodwin and Ian Ward. 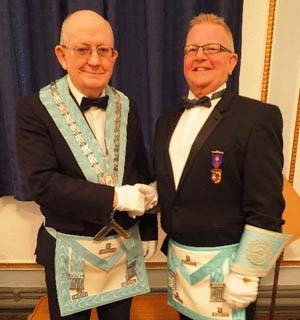 David then commended Mike Notman for the excellent manner in which he had conducted the ceremony and John Davies for his excellent conduct and bearing throughout the proceedings. He thanked Malcolm Burrell for his fine music during the meeting, adding that it was always a pleasure to hear fine melodies from an expert organist. Pictured left: David Walmsley responding to the toast to the grand officers, keenly observed by Ian Ward. Pictured right: Godfrey Hirst (right) singing the master’s song to John Davies. Continuing, David also thanked Tony Alderton for his kind assistance as lodge secretary leading up to the meeting and his son Roland for his work as director of ceremonies. He also congratulated Tony on his impending promotion to Past Provincial Grand Sword Bearer, also thanking David Kenworthy on his excellent year as the Provincial Grand Sword Bearer. David also spoke of the West Lancashire 2021 MCF Festival, urging those who hadn’t already done so to complete pledges and obtain their Festival Steward Jewel. 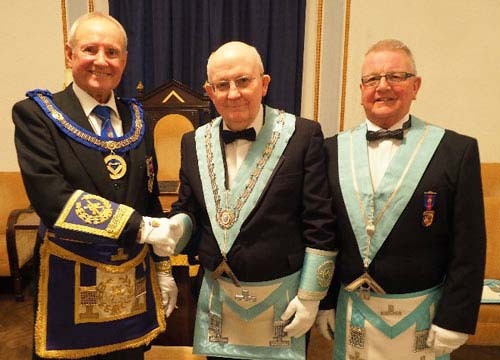 He further urged those who were not members of the Royal Arch to speak to Mike Goodwin, the lodge Royal Arch representative about joining that order. Concluding, David give a measured report on the improvements in membership numbers. He attributed this to Pathway, ambassadors and mentoring initiatives. He also told of how the movement to more openness of what we do and the ‘enough is enough’ campaign, along with the many charitable donations to society at large, such as new fire engines and air ambulances. A Westhoughton raffle raised £91.50 for charity and proceedings were brought to a close by Brian Sager, who delivered a unique and poetic tyler’s toast. Pictured, from left to right, are; Mike Goodwin, David Randerson, Godfrey Hirst, David Walmsley, John Davies, Ted Eaves, Stuart Thornber, Ian Ward and David Kenworthy.